See my Photo page for the basics on taking fun photos for your scrapbook. This post is for additional fun tips. An obsessive compulsive scrapbooker finds paper she loves and plans events/outfits to coordinate with it. Sound crazy? I know someone who did that. NO, not me!!! However, I was a little crazy one year with matching outfits. We all HAD to wear white sweaters — BORING! Fortunately the outfits don’t stand out as much as the weird hair. You don’t have to do anything like this…..although I guarantee one day when you look back, you will see a photo that you look at and say “What was I thinking……or not”. LOL. -When you’re ready to take a photo of somebody, take your first photo and then take 3 giant steps forward toward your subject and snap another. Nine times out of ten the last one will be the better shot. Sometimes we get too much background and not enough subject. Photographing infants – before you start taking photos, put a piece of clear, double face tape on one of their hands. That immediately gets their attention and when their hands stick together a bit, you get some great expressions and interesting hand positions. He currently has a great website called makeitez4me. It’s all about getting healthier. http://makeitez4me.com in case you’re interested. – Don’t be afraid to use props for that “formal” photo. They use them in the studios all the time. How about that teddy bear, goofy hats, Christmas ornaments …. anything to keep people smiling. -Don’t always pose. Take random photos of candid moments. Sometimes they’re the best. In fact, hand the camera (if you dare) to a child and let them take a few photos. They will have a totally different perspective which can be really interesting. -Use “natural” frames. This can be anything – trees, bridges, monkey bars, windows, doors, etc. 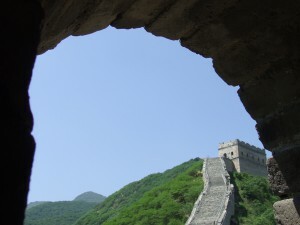 Here’s an example of a photo I took of the Great Wall in China. I was looking out one of the windows. -While I do have a tripod, I don’t use it often. So, when I’m taking a photo that requires VERY steady hands or when I’m using the timer, I simply stack up a bunch of books on a table or chair and set the camera on top. -Be creative and look for “odd” shots. Photos that are mirror images are fun. 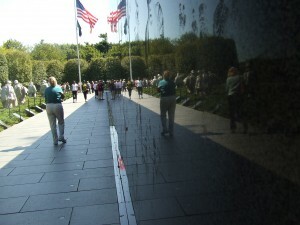 The reflection can come from water or a monument like this one that I took in Washington DC. I was standing by the wall and it reflected everything in front of it. I hope these tips help stir up some creative ideas. Unlike the “old days”, we can now snap a LOT of photos and pick out the ones we want to print. Thanks for reading. Please leave comments. Like George said, this is an awesome site. One of my best friends from second grade is dedicated to scrapbooking. We were talking about everything under the sun one day, as friends love to do, and I asked her that if she found out she had only three months to live, what would she do first. And she said “I would finish my scrapbooking! !” which I replied…really? I am pretty sure only an avid fellow scrapbooker would understand her answer. :)) Of course she wants to be sure her family and friends have a wonderful history of their lives with her. Which I think is just beautiful. Your photos are awesome and they have given me some great ideas. Actually, I have drawers full of pictures and you are peaking my interest to start looking into scrapbooking. My childhood friend would be thrilled. Thank you for sharing your creative ideas. Thank you for checking out my site, Lynn. I do understand your friends comment. If she’s like me, she’s behind. I keep making scrapbooks for gifts and not doing my own. I guess it’s like when I was doing taxes, my own were mailed on 15 Apr. LOL. Even if you don’t scrapbook per se, please don’t leave unlabeled pix. I have many of those from my parents and I feel like I’m missing so many stories. Much of the beauty in scrapbooks is the stories and emotions that the pix represent. Let me know what I can do to help. What an awesome site you got here. I love the idea of creating scrapbooks. And with such a wealth of information I am keen to start right away! I mean, that mirror image effect you demonstrate is absolutely unique and definitely appealing! I’ll make sure to be back for more!